Cool People Care has created a Somos Nashville Spanish-language t-shirt as part of their We Are Nashville fundraising campaign for the Community Foundation efforts toward flood relief. 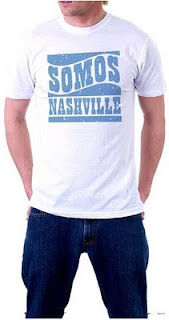 According to Cool People Care, the Somos Nashville t-shirt acknowledges Nashville's "vibrant and caring Hispanic community," and all profits from the purchase of the shirt will go toward the flood relief efforts of the Community Foundation and Conexion Americas. "Somos Nashville" means "We Are Nashville" in Spanish. You can buy the shirt for $20 here. On May 11, the City Paper reported that the campaign had raised $35,000 and had been mentioned on-screen by CNN's Anderson Cooper. [T]he key phrase ["We Are Nashville"] has ignited volunteers and supporters throughout the state and beyond, all of whom stand up to identify with people who were "handling it on our own.” Included in that group of people is Nashville's vibrant and caring Hispanic community. 1) Supported the Community Foundation’s Flood Relief Fund and Conexión Américas (100% of the profits from this shirt will be split between these organizations) which means all money stays local in the affected areas to assist nonprofits who are helping victims of this disaster. 2) Makes a statement about the kind of community you live in that is quick to help a neighbor and rebuild a great city, including areas of people who call Nashville home, no matter where they were born. The shirt is 100% organic cotton and printed by Friendly Arctic Printing and Design in the heart of East Nashville with non-toxic inks. The design was donated by Rob Williams. Shirts are currently in pre-production and will ship beginning on May 24. Buy the shirt for $20 here.